The intelligent security technology for the banknote of the future, has been featured in the most renowned and scientifically recognized publication in the security industry, the Keesing Journal of Documents & Identity. The DICE banknote system, a technology that is defining the future of cash and an essential component of global crime prevention, had the privilege to be presented as an innovation in the 49th issue of the Keesing Journal of Documents & Identity (KJD&I). 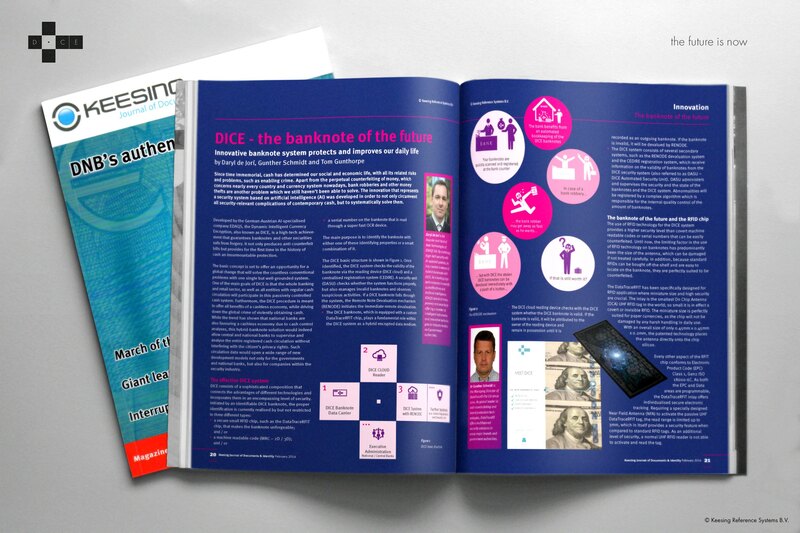 Covering four pages, the DICE’s AI-driven technology is explained in detail and in the style of a defensive publication, along with comments and statements from EDAQS’ head of new technologies, Daryl de Jori, as well as from Dr Gunther Schmidt,the former Managing Director of DataTraceID and now Independent Brand Protection Adviser, who envisioned the use of miniature RFID microchip (RFIT) for the DICE banknotes. Apart from a scientific explanation of the DICE, the article enlarges upon the benefits for the people’s quality of life as well as the overall improvement of cash circulation. In a realistic mid-term scenario, EDAQS draws a future that sees digital hybrid banknotes unavoidable and the countless advantages of Artificial Intelligence indispensable. EDAQS’ most prominent AI system obtained a broad media attention and was subject to a major discussion for the future of cash among national banks and governments. Most recently, DICE equipped banknotes have been conversed as an alternative scenario to the abolition of the 500 Euro banknote that is planned by the ECB. The Keesing Journal issue 49 can be ordered at Keesing’s official journal website. DICE (Dynamic Intelligent Currency Encryption) is an exceptional hi-tech achievement, which solves thousands-of-years old problems and guarantees unforgettable banknotes, securities as well as other important documents. In addition to the persistent counterfeiting, which affects virtually every country and currency system, holdups and bank robberies are a present problem that could not be solved until now and needs to be addressed. EDAQS is a high tech company that combines the accuracy of automated computational systems with advanced Artificial Intelligence to provide more transparency and the uppermost precise hi-tech systems. For more information, visit: http://www.edaqs.com/about/ and http://www.edaqs.com/who-we-are/. The Keesing Journal, which is issued by industry pioneer Keesing Technologies, is a well-known and much respected publication for and by specialists, developers and suppliers in the field of security documents, security printing, banknotes and identity management. As a directive journal for thousands of industry and government professionals, the Keesing Journal provides its readers excellent information on the latest developments and trends in the industry and various areas, including biometrics, e-passports, security printing and banknotes. DICE: The banknote of the future valuated at an average of $5.6 Billion.